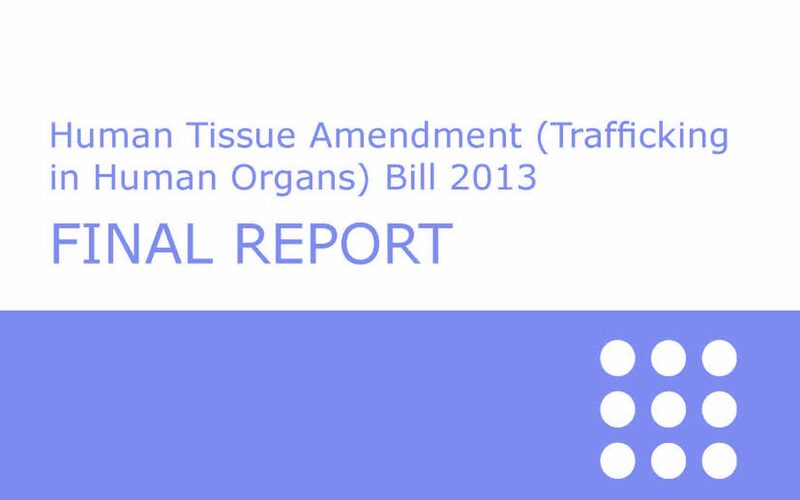 The NSW Greens are today formally releasing the report on a draft organ trafficking law called the Human Tissue Amendment (Trafficking in Human Organs) Bill 2013. The Greens are currently proposing law reform to create specific offenses of receiving harvested or trafficked organs within NSW or overseas. Such law reform could highlight the injustice of the global organ trade, and provide a strong disincentive for NSW residents to participate in it. The Final Report and proposed legislation are now available for consideration and dissemination. Following an extensive consultation process we have produced a Final Report which details the results of this consultation. We found overwhelming support for the proposed changes with thousands of people providing submissions in support of it. Feedback from the consultation process identified a concern with the legislation as drafted as it related to countries with “opt-out” organ donation schemes. As part of considering this reform we produced a comprehensive consultation paper, which can be downloaded here. We undertook broad consultation with the community, members of the medical community and other stakeholders in relation to this proposed reform. Submissions were received until 7 March 2013. The final report follows detailed consideration of the submissions received. As medical advances have improved the success of organ transplantation, there has also been a rise in the illegal harvesting and trafficking of organs. Internationally this has led to a market developing so that those with money to buy organs are able to visit countries where forced organ harvesting occurs in order to receive a life saving transplant. This produces real and ongoing abuses of human rights. At its worst organ harvesting can see people killed to order, with one person’s life being deliberately taken to save another. While most countries have laws prohibiting both the sale and forced removal of human organs, there are a number of countries where the practice continues to be widespread. This includes countries in our region such as China. One way of addressing this brutal trade, is for countries such as Australia to impose prohibitions on its citizens and residents from receiving trafficked organs, wherever the transplant occurs. This would make it a crime for Australian citizens to receive organs sourced by illegal and unethical means. Such a prohibition should also serve to direct attention to the need to improve organ donation rates in Australia and NSW. This office produced draft legislation entitled the Human Tissue Amendment (Trafficking in Human Organs) Bill 2013 which seeks to address this problem. The draft legislation is annexed to the consultation paper, which can be downloaded here. The consultation paper seeks to set out the international context for the bill and to consider the methods that can be adopted locally to reduce the likelihood of Australian citizens taking part in the illegal and unethical trade in human organs. We need continued international pressure to end this immoral trade. This Bill is part of that action. ‘Patients who go overseas to buy a trafficked organ for transplant will face a jail term of up to 25 years under a bill to go before the NSW Parliament early next year. The Greens want to make international organ trafficking a criminal offence in the state. Waiting lists for official organ transplants are so long that a handful of Australians travel overseas every year to buy organs in overseas jurisdictions. The organs are transplanted overseas and the patient returns here to continue life-long anti-rejection treatment. Greens MP David Shoebridge says some of these organs come from political prisoners in China who are put to death and have their organs harvested. “At its worst organ harvesting can see people killed to order, with one person’s life being deliberately taken to save another,” a Greens discussion paper on the issue says. Under the bill, patients buying organs, middlemen procuring them and selling them and doctors transplanting trafficked organs overseas would all be committing a crime and face a penalty of six months imprisonment or a $4400 fine. If a vital organ such as a heart is removed it would attract a jail term of up to 25 years. Doctors and nurses who were aware that an Australian patient had procured a trafficked organ overseas would be obliged to report it, Mr Shoebridge says.